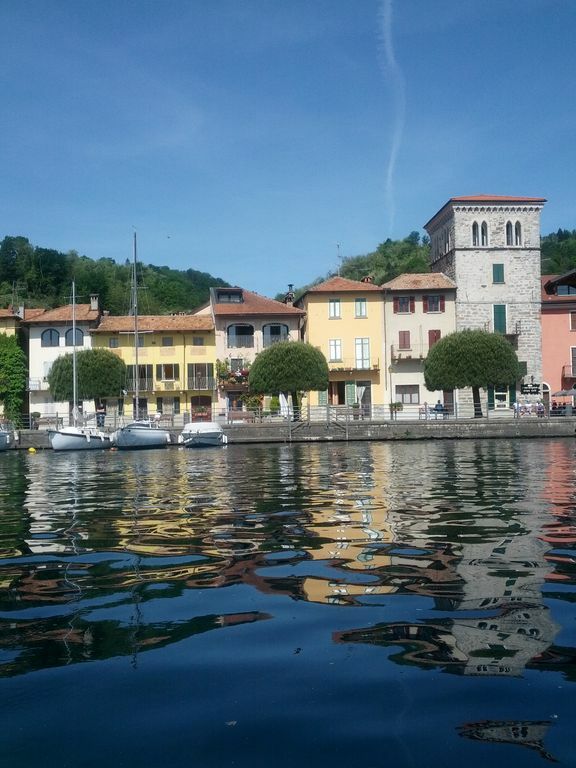 (Text automatically translated) the apartment has been renovated in 2008, enjoys a splendid view of the island of S.Giulio.E 'located in Pella, a picturesque town overlooking Lake Orta. Garden (15 sqm) peaceful and quiet at the back of the house. E 'possible to make excursions in Sesia Valley, Val d'Ossola, Val Grande, Lake Maggiore (Stresa-Borromee.Bellezze artistic Islands (S.Filiberto, Madonna del Sasso, Ronco) cultural events, nature and relaxation make it enjoyable and unforgettable vacation. A view to dream of and feast upon. Casa Lungo Lago 20 was just as it appears on the website. The property is beautifully presented,very well equipped and spotlessly clean. Pella itself is such a lovely, peacful little town. Surrounded by beautiful scenery and perfect for relaxation, but also within easy reach of the interesting areas of Orta, Isolo San Guilio etc. Local Restaurant/Pizzeria/ Supermarket/ Ferry etc only a few metres distance. "A well equipped apartment, furnished in good taste with a lot of space and sufficient comfort.It is really a ''room with a view''. Excellent location from which you can easily reach lots of interesting places. The owners are very friendly and helpful. We had some car problems and they helped us to deal with it. An enjoyable and relaxing holiday, one on which we think back with a warm feeling." "A nice well equipped apartment just in front of the lake in a small village. The owners were very friendly and helpful." "Positive : Very quiet environment and magnificent vieuw on the lake, the house is perfectly clean, very friendly people and a grocery store and restaurants are nearby. Kitchen equipment could be better(no 15 cl koffeecups) and the garden really is not the most cosy place we have seen. Tolle Ferienwohnung in perfekter Lage! Wir haben einen unvergesslichen Urlaub am Ortasee in dieser tollen Ferienwohnung verbracht. Die Wohnung ist direkt am See und bietet alles was man braucht, auch die Eisdiele ist in unmittelbarer Nähe. Die Vermieter sind sehr nett und hilfsbereit - wir haben uns sehr wohl gefühlt und kommen auf jeden Fall wieder! Nel periodo 1 luglio - 02 settembre gli ospiti dovranno soggiornare un minimo di 7 notti. E' possibile fare il check-in solo di sabato. Richiesto supplemento per il riscaldamento in base alla stagione. Consegna delle chiavi da parte del Proprietario.